Are You a Sales Stalker…Do You Call to ‘Just Touch Base’? 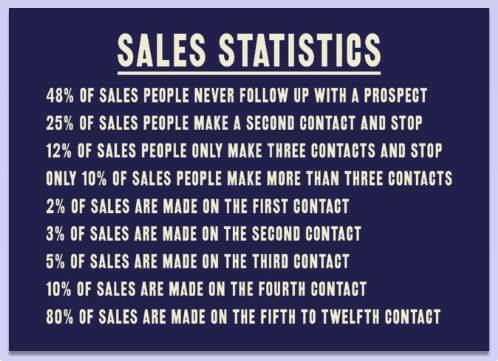 Sales Statistics – How Many Times Should a Sales Person Chase a Prospect? I saw this image posted on the Institute of Sales and Marketing Management (ISMM) Facebook page last week – and although I’ve seen these figures before, they never cease to amaze me. However, I don’t doubt they are true. So how are you going to make these stats work for you? We all know that nothing is guaranteed to get the sales person on the ‘blocked call’ list faster than that sort of dogged and unimaginative pursuit. Let’s imagine that you have to take your sales prospect through 12 contacts – how might you structure those contacts? Here are random examples of how you can easily achieve your 12 contacts without too much efforts. Not all prospects are worth chasing! Not all prospects have sufficient value or margin to allow you to chase in a highly sophisticated or time consuming way – use your time cautiously. Not all prospects are worth chasing equally. No prospect that wants to do business with you will be waiting for you to call them – they will call you. If your calls aren’t returned, emails not responded to, it doesn’t always mean the prospect doesn’t want to do business with you. It may well mean that they don’t want to do business with you NOW. Sometimes it means you have been binned, so, continuing to make contact (or trying to) will waste your time but can’t harm the relationship any further…and you never know. So 14 Contact Points to adopt with your sales prospects that avoid the ‘have you signed the contract yet’ chaser. Be Social – Invite them to lunch – everyone needs to eat. Be of Value – Find out who they would like introductions to, their ideal referrers, their ideal prospects, ideal clients – and make the introduction. You can make the introduction via email or face to face. Flag – Send then a white paper/article/news story that will be of interest to them. Group Social – invite them to one of your business events, football, concert, races, early bar somewhere nice. And finally…don’t forget to call just to ‘Just to Touch Base’…if you really really have to! 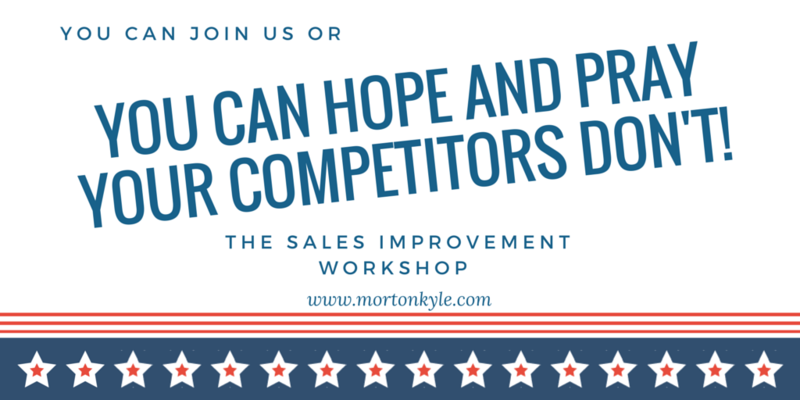 So confident am I that I can turn your sales performance on its head – you get a full money back guarantee – come on, join us and see what you can really achieve.